The cytoplasmic domain (amino acids 676-1255) of human HER2 and the cytoplasmic domain (amino acids 669-1210) of human EGFR are expressed as N-terminal peptide (DYKDDDD)-tagged protein using a baculovirus expression system. 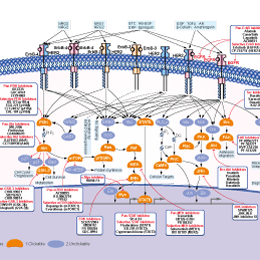 The expressed HER2 kinase and EGFR kinase are purified by anti-FLAG M2 affinity gel. The EGFR and HER2 kinase assays are performed using radiolabeled [γ-32P]ATP in 96-well plates. The kinase reactions are performed in 50 mM Tris-HCl (pH 7.5), 5 mM MnCl2, 0.01% Tween 20, and 2 mM DTT containing 0.9 uCi of [γ-32P]ATP per reaction, 50 μM ATP, 5 ug/mL poly(Glu)-Tyr (4:1), and each purified cytoplasmic domain (0.25 μg/mL EGFR or HER2) in a total volume of 50 μL. To measure the IC50 value for enzyme inhibition, Increasing concentrations of TAK-285 are incubated with the enzyme for 5 minutes prior to the reaction at room temperature. The kinase reactions are initiated by adding ATP. After 10 minutes at room temperature, the reactions are stopped by the addition of 10% (final concentration) trichloroacetic acid. The γ-32P phosphorylated proteins are filtrated in a harvest plate with a cell harvester and washed free of [γ-32P]ATP with 3% phosphoric acid. The plates are dried followed by the addition of 25 μL of MicroScint0. The radioactivity is counted by a TopCount scintillation counter. IC50 values are calculated by nonlinear regression analysis of the percent inhibitions. Method: The cells are treated continuously with various concentrations of TAK-285 for 5 days. The live cell numbers are counted with a particle analyzer. Ishikawa T, et al. J Med Chem, 2011, 54(23), 8030-8050. Aertgeerts K, et al. J Biol Chem, 2011, 286(21), 18756-18765. Erdo F, et al. Brain Res Bull, 2012, 87(4-5), 413-419. Erlotinib HCl (OSI-744) : EGFR-selective, IC50=2 nM. Lapatinib : Irreversible, mutant-selective EGFR inhibitor with Ki of 21.5 nM and 303.3 nM for EGFRL858R/T790M and EGFRWT, respectively. 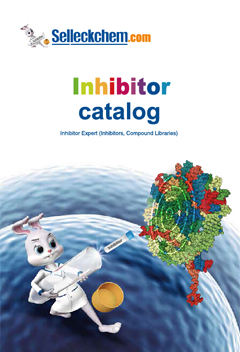 CO-1686 (AVL-301) New : Mutant-selective EGFR inhibitor for EGFR(L858R)/(T790M) with IC50 of 2 nM/8 nM.